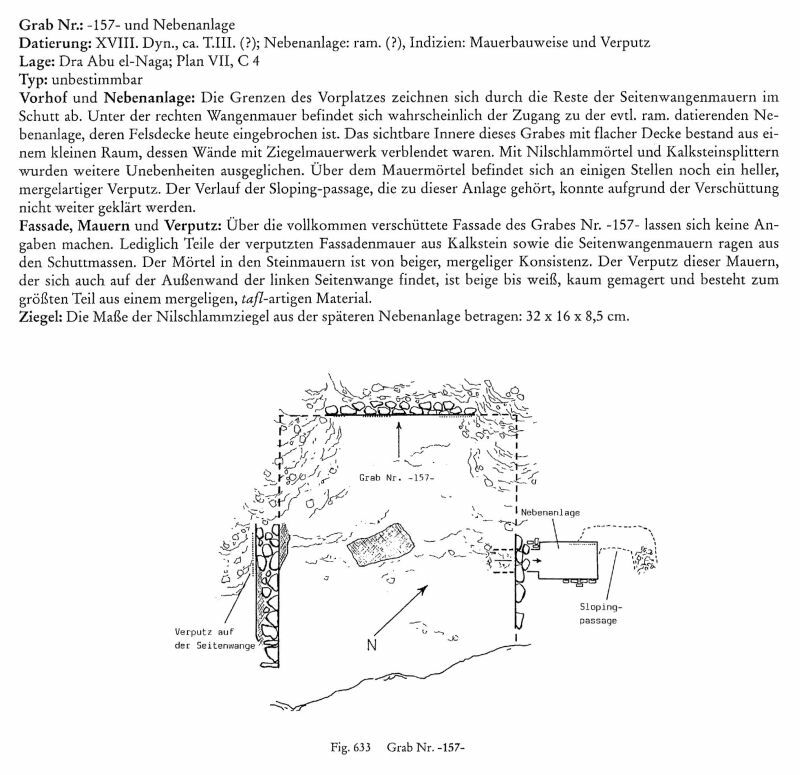 Posted: Tue Apr 18, 2017 12:59 pm Post subject: Luxor Tomb Kampp T -157- Excaveted - Cachette from 21st Dyn. Tomb of Userhat, Draa Abul Nagaa, West Bank, Luxor. The Egyptian archaeological mission working in Draa Abul Nagaa necropolis on Luxor’s west bank unearthed the funerary collection of a New Kingdom tomb of Userhat, the city jury. Tomb Description: It represents a typical example of a nobleman tomb. It is a T-shaped tomb consists of an open court leading into a rectangular hall, a corridor and an inner chamber. After removing almost 450 metres of debris out of the open court, appeared the entrance of the tomb as well as two other entrances leading to two joint tombs.Excavation works are at its full swings to reveal the secrets of these two tombs. Inside the rectangular hall, a well-preserved wooden coffin, decorated with coloured scenes, was unearthed and a nine metres deep shaft was uncovered. Inside the shaft, the mission has located two rooms; one on the eastern side where a collection of ushabti figurines, wooden masks and a handle of a sarcophagus lid was unearthed. The second one is located on the western side but did not completely excavated yet. Team Work: Dr. MostafaWaziri, Head of Archaeological mission Mohamed Khalil Head of the Antiquities Inspectors Mohamed Daabish and Ahmed Al-Tayeb, Antiquities Inspectors Ahmed Baghdady and Ramadan Salem, Restorers. Fotos atteched : New Discovery at Luxor - Tomb of Userhat, Draa Abul Nagaa, West Bank, Luxor. Update : " Egyptian Archaeologists Unearth Tomb of 18th Dynasty Magistrate in West Luxor " (Ahram Online). Some extra pictures : Kampp, T -157- , Tomb of Userhat. Exciting news. Following further developments closely.